Faulty assumptions aside, Bill Gates’ advice to use vaccines to reduce population is based on his thinking that women will not feel the need to keep reproducing if child survival rates improve. The following charts were prepared from crude birth rate data supplied by the Centers for Disease Control. The first one of relevance comprises the entire 100 years since records have been kept (1909-2009). Prior to 1970, birth rates were estimated. Since then, the CDC uses data legally required to be submitted from all 50 states. From 1909 thru 1933, the birth rate dropped a whopping 39 percent (from 30.0 to 18.4). During the Great Depression, the birth rate hovered around 18.8 from 1933 thru 1940. Once the depression officially ended in 1941, and women entered the workforce in mass numbers (as in Rosie the Riveter), the birth rate climbed to its next major peak of 26.6 in 1947. For the next decade, the US birth rate hovered around 25.2 — the “baby boom” years. From 1957 thru 1976, the birth rate plummeted again — this time, by a shocking 42 percent. There were a couple slight upticks in there, but in 1975 and ’76, the crude birth rate was 14.6, the lowest it had ever been. 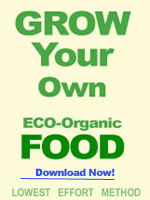 And this is 20 years before the commercialization of GMO foods. We then see a slight rise thru 1990 when the rate peaked at 16.7, and next a general decline thru 2009 when it bottomed at 13.5 live births – the lowest it’s ever been in 100 years of record keeping, but a drop of only 1.1 from the 1976 rate — the previous all-time low. 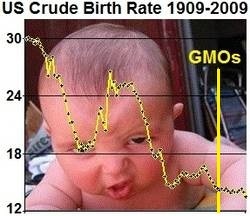 Now let’s consider whether 15 years of GM foods have reduced the US birthrate. Without labeling and follow up testing, we may never know. We do know that many factors contribute to infertility, including cultural factors, agrochemicals and other industrial pollutants – many of which are endocrine disrupters that affect reproduction, as well as parental health, and perhaps vaccines and pharmaceuticals, most of which contain GMOs. From 1990 thru 2009, the birthrate dropped 19 percent. Of course, the effects of spermicidal food would not be immediate, and 2009 does show a serious drop when the birthrate fell to 13.5. As has now been shown, though, this latest decline (from 1990) is not the biggest drop since records have been kept. In fact, the rate of decline has slowed since GMO deployment. I’m not saying mass sterilization isn’t underway (I have no evidence either way), just that GM foods cannot yet be tied to declining birth rates. Toxic aerial sprays and industrial pollutants cause infertility, as well, and hasn’t deregulation of pollutive industries proceeded swiftly the past several years? Wasn’t it in 2004 that the EPA said fracking posed no health risk, and so exempted the drilling industry from the Clean Water Act? An important aside: The idea that increased wealth reduces the birth rate is contradicted by US numbers. Once the Great Depression officially ended in 1941, the US birth rate climbs. Also, since the late 1960s when real personal wealth declined for most Americans, the birth rate also declined. In fact, maternal education level may be a more significant factor. By comparing the US to other nations, we can begin to tease out the impact of GM foods — by analyzing the birthrates of other nations and the number of years (and to what extent) they’ve been eating GM foods, if any. While some experts estimate that 70% of the foods we eat in the US contain GMOs, that percentage is not as high in other countries with lower birth rates. At the international level, of the 196 nations whose 2009 birth rates were reported by the World Bank, 57 had lower birth rates than the US, including Canada, France, Germany, Italy, Russia, and the UK. Of those 57 nations with lower birth rates than the US, 44 do not permit GMO crops (see list of GM nations at the pro-GM group,ISAAA). US teen birth rates are probably even more important to watch, as some of these kids have been ingesting GMOs their entire lives, from the moment of conception. Comparing that to other nations’ teen birth rates might be most revealing, especially when factoring how much GM food those teens are eating and for how long. 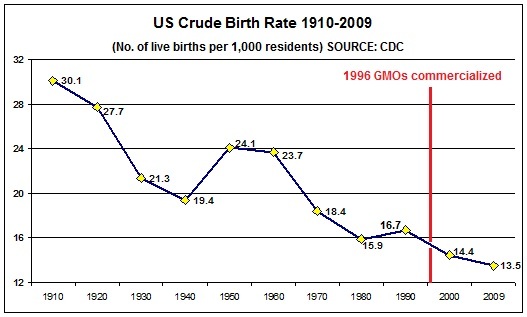 In sum, the US crude birth rate has generally declined since 1909 when records were first kept. There have been two substantial plummets in our birth rate: from 1909 thru 1933, when it dropped 39 percent; and from 1957 thru 1976, when it dropped 42 percent. Between these two dips is the baby boom era. 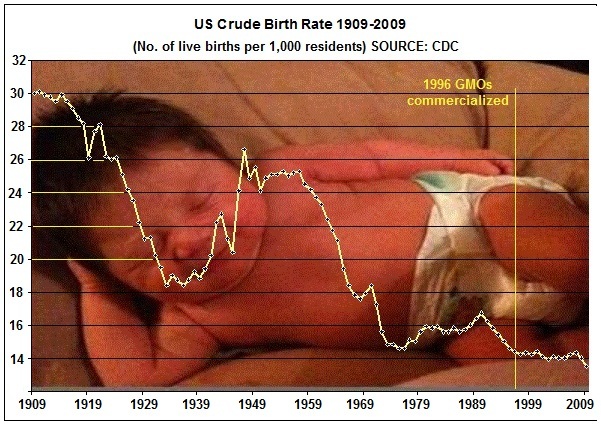 Since more accurate records were kept starting in 1970, the US crude birth rate has fallen 26 percent. From 1996, when genetically modified foods were deployed, to the present, the birthrate has fallen six percent. 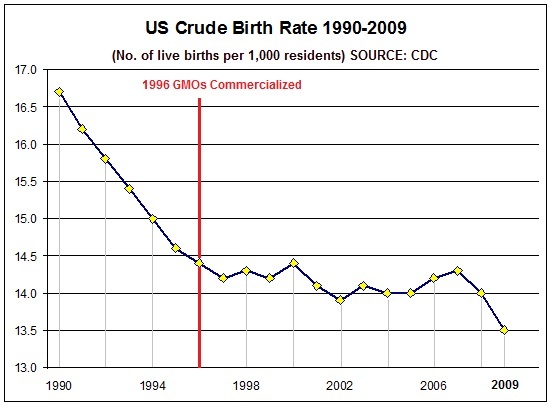 From this data, we can derive no information about the birth rate impact of any spermicidal GM foods that the US may have ingested.